The relationship between cruelty to animals and the abuse of women and children has been informally recognized throughout history (Ascione & Arkow, 1999). A folk proverb advised, “A woman, a horse, and a hickory tree; The more you beat ‘em, the better they be” (cited in Adams, 1995). Similarly, George Cannon, leader of the Church of Latter Day Saints in the 1890s, warned, “Young ladies, never put yourself in the power or under the control of young men who treat their animals badly, for if you become their wives, they will abuse you” (cited in Quinlisk, 1999). More recently, popular belief in a link between animal- and human-directed violence has been codified in state legislation establishing cross-reporting systems that permit or require animal cruelty and child welfare investigators to refer families to parallel agencies for investigation (Long, Long, & Kulkarni, 2007). Such laws are based on the assumption that families experiencing one form of violence victimization will be at an increased risk for other forms of violence (DeGue & DiLillo, 2009). 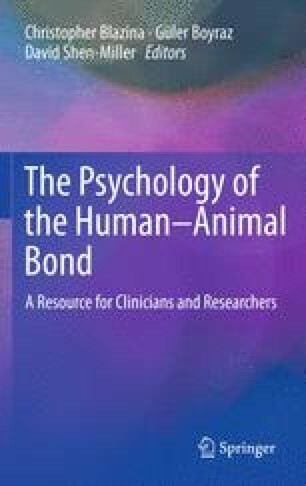 This chapter provides an overview of current knowledge regarding the extent and nature of this overlap, discusses possible explanations for the exposure of family members (human and nonhuman) to multiple types of violence victimization, and highlights potential implications for prevention and early intervention.